In the future, humans may be able to sail through the universe to discover new lands, much like the early explorers on Earth. A Kickstarter campaign that launched Tuesday is looking to make the first step toward this dream. The campaign, which is fronted by Bill Nye (of "the Science Guy" fame), is asking for contributions to send a small spacecraft into the universe next year. 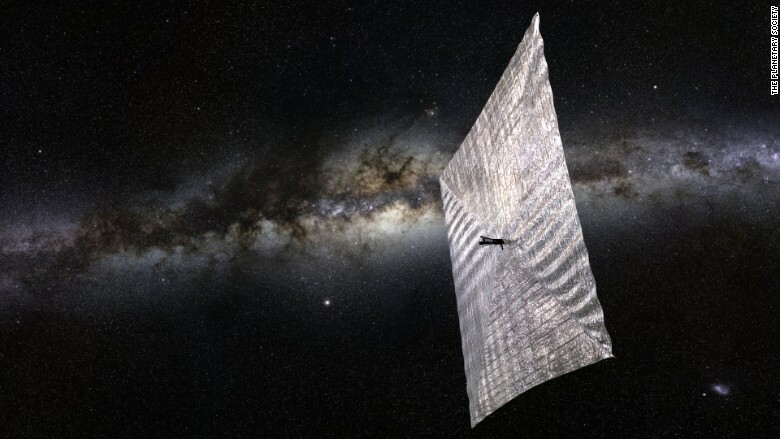 It will hurtle through the cosmos thanks to a large, solar-powered sail. Nye hopes the public will be willing to take an active role in space exploration, and said crowdfunding is a way to make the universe more accessible. 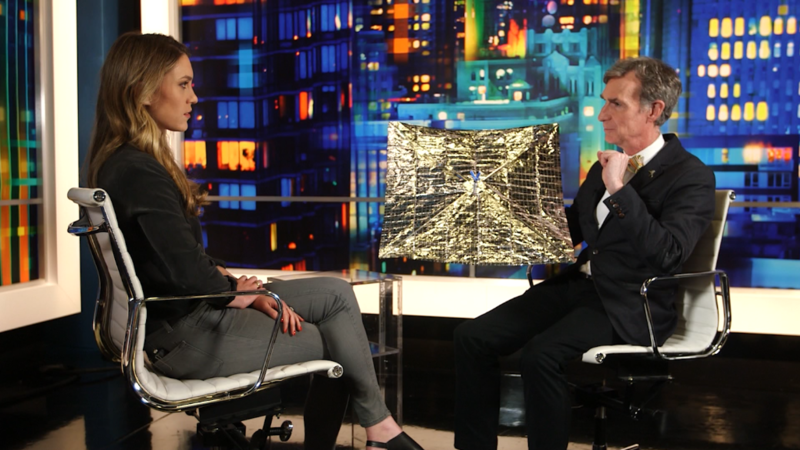 "This is where you don't have to answer to everybody, you don't have to satisfy everyone," Bill Nye told CNN's Rachel Crane. If NASA did this mission, Nye said, it would be at least three times as expensive. With this, "you can take chances and be risky." The project is backed by The Planetary Society, an organization founded by Carl Sagan that invests in space innovation and exploration. Nye is its CEO. Sailing through space may seem strange, but there's some serious science behind it. The sail is made of a large piece of thin mylar (the shiny stuff that helium balloons are made out of). It won't fill with wind, but will instead be powered by light. Particles of light actually have momentum, and when they hit something reflective, like mylar, they exert a little force and push things along. Since the power comes from light, not jet propulsion, there's no need to worry about fuel. This idea has been in the works since the 1970s, when Sagan first brought it up to Johnny Carson on The Tonight Show. Nearly 40 years later, and Nye is attempting to realize the dream. An artist's rendition of a spacecraft travelling the universe, powered by a solar sail. "At my age, we grew up with Apollo and that was an extraordinary thing. People walked around on the moon. We learned more about the age of the Earth and it just brought out the best in us," Nye said. The spacecraft the society is looking to send into space is small -- about the size of a loaf of bread. The technical name for it is a CubeSat, and the sail is folded inside. The CubeSat is stored in a box the size of a toaster oven, which attaches to a rocket that's shot into space. When it reaches the right elevation, a spring launches the CubeSat into orbit. Once there, engineers will flip a switch, and the sail -- about size of a studio apartment -- will open. It can be controlled from Earth so the engineers can navigate it around space. "When we explore space, we solve problems that have never been solved before," Nye said. "We learn more about what I like to call our 'place in space.'" The CubeSat is equipped with cameras and will take photos to send back to Earth. The Planetary Society tried to launch something like this ten years ago. In that mission, the CubeSat was attached to a Russian rocket, which was actually a repurposed nuclear submarine missile used in the Cold War. It took off, but the engines failed a minute and a half into the flight. It crashed into the Arctic Ocean. The society is going to try again with two upcoming missions -- one in two weeks, where it will attach to an Air Force rocket in a test mission, and another next year, when it will attach to a SpaceX rocket. The second is the one they're seeking funding for. The goal of the Kickstarter was $200,000 -- well below the cost of the mission, which will be $5.45 million (about $4 million has already been used for development). It's the first time the society has used crowdfunding. Nye is optimistic, and he should be -- in less than two days, the campaign has surpassed its goal of $200,000 and is still going strong. "When you go exploring, two things happen," Nye said. First, you make discoveries. "The other thing is you'll have an adventure, and I think we all want to be part of space exploration."